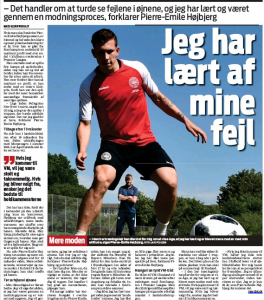 Pierre Emile Højbjerg is back in Danish contention after a fall out with national manager Åge Hareide. The Southampton player was deemed to have an attitude issue whilst away with Denmark, and Hareide spoke about it publicly, perhaps going a little over the top in his criticism. That’s all forgotten now and Højbjerg is working hard to convince his manager to take him to the World Cup. Denmark have called up a preliminary squad, and Højbjerg doesn’t want to be one of the unfortunate ones cut from the selection. It’s easy to forget how young Højbjerg still is and there’s always likely to be issues with a talent developing. Now firmly on the right track, it’ll be hoped there can be further progress made this summer… in Russia. The post Southampton player explains what Pellegrino told him just before he left appeared first on Sport Witness.